Are you looking to have more cash left over at the end of the month? Cutting expenses to help you save money can help you do that. However, there comes the point in every budget when you can’t reduce expenses any further. At that point, there’s only one thing you can do to reach financial goals faster. And that is to increase your income. The more income you have, the faster you’ll reach those goals. However, this is only true provided you are managing your money well. You need to manage it in a way that aligns with your vision. 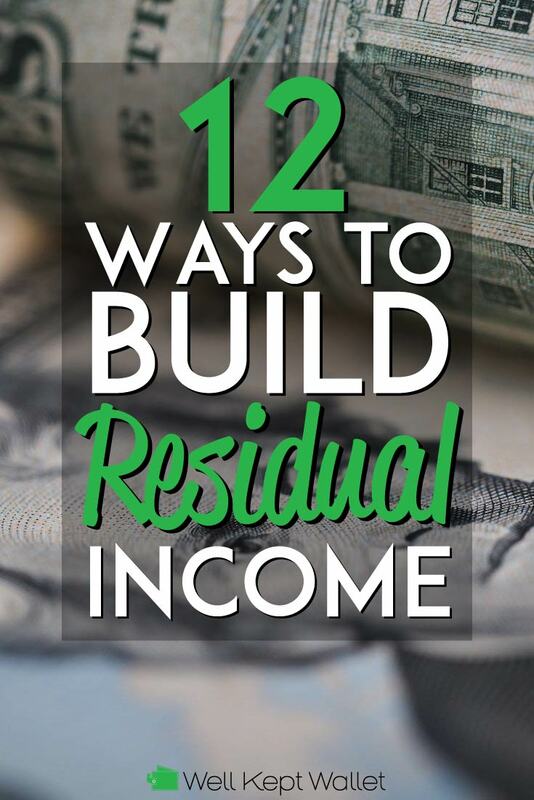 The term “residual income” refers to two different things. From an accounting perspective, it has to do with management. Residual income is the amount of money you have left over each month after you pay the bills. From a business perspective, residual income means passive income. It’s income you gain by doing one-time work or very little work. Both definitions have the same goal. What is that goal? To increase the amount of money you have to do what you want with. And other goals. So you can see why residual income is so important to have. But you’re not going to increase your residual income by winning the lottery. Typically, it’s a slow and steady process. First, you start by decreasing expenses. Go through your budget. Use the Challenge Everything Budget to see what you can eliminate. Or at least see what expenses you can reduce. After you’ve decreased expenses, you’ll work on increasing income. I’ve listed below some ways you can build your monthly passive income levels. This will help you to have more money coming in each month. More money equals faster achievement of goals. Again, management of the money you earn is key here. All the income in the world won’t help if you’re blowing it. That’s easy to do without a budget and a plan. Set your budget in place first. See where you can cut wasteful expenses. After that, look into passive income ideas. Check out the list below. See if one or more of these avenues to more residual income is right for you. Real estate investing has long been touted as a smart way to build passive income. However, not everyone can afford it. To buy a rental property, you have to put twenty percent down. And it takes work to own and manage rental properties. Enter, crowdfunded real estate investing. The premise behind crowdfunded real estate investing is simple. People lend money to a person or company. The person or company is typically an expert real estate investor. The expert real estate investor uses the money to purchase real estate. They might be residential or commercial real estate properties. Then they flip or rent out the properties. Over time the property increases in value, gains rental income or sells. Investors who contributed to the purchase or management of the property earn income. So they get the profit without having to own or manage the property. Two of the most popular crowdfunded real estate companies are Fundrise and Realty Shares. Each of the companies work a little bit differently. Here are the basics about Realty Shares. An accredited investor meets one of two different financial parameters. They can either have a minimum of $200,000 personal or $300,000 joint-with-spouse income. This income has to exist for the last two years and be expected to continue. Another option is that they have a net worth of $1 million. If they do, the income requirements are not necessary. Here are the basics about Fundrise. Do you want to start making residual income via real estate investing? Are you interested in not physically owning and managing properties? If so, crowdfunded real estate investing might be right for you. However, it’s important to know there is the the chance of the loss of your initial investment amount. In this way, it’s no different than other types of investing. Financial experts such as Warren Buffett swear by dividend investing. Buffett himself used it as a path to building residual income. Dividend stocks are generally blue chip stocks. Blue chips stocks are stocks in companies with longstanding histories. They pay dividends to customers on a regular basis. For instance, they might pay each quarter or once a year. Do you like trading stocks? If so, check out Ally Invest as they charge as little as $3.95 per trade. This is great because many brokers charge much more than that. Some investment firms charge hefty fees. It can cost a lot for investors who participate in their dividend investment strategies. However, robo-advisors (companies that have automated management systems in place) make investing affordable. That means increased potential profit margins for you. One of the top robo-advisors is Motif. They’re well-known for low fees and diversified portfolios. Keep in mind that investing with robo-advisors does hold a potential risk of loss of investment funds. This is no different than with traditional investment management firms. However, with the right picks and a healthy stock or bond market you can use dividend investing to increase your passive income. Online stores can help you increase your residual income one of two ways. You can have your online store function as a drop-shipping site. This means you collect the orders and then send them to the distributor of the product. The distributor houses and delivers the products. You get a slice of the profit for selling the item. Or you can keep an inventory of the products you sell online. You ship them from your house or warehouse to the client. However, this route would be more time-intensive. Therefore it’s not considered a passive income source. Either way, whether you choose the drop-ship method or selling directly, companies such as Shopify can help. They’ll help you set up a professional online store, online shopping cart, etc. But know that you’ll be sharing your profits with Shopify or other e-commerce companies for that service. Publishing a book can be a great way to increase passive income. Once the book is done and published, the only work left for you to do is market it. Do I want to offer the book in e-book format only or as a paperback or hardcover too? Will I create and publish the book myself or use an outside source? Will I edit the book myself or hire someone to do it for me? Going with the e-book only route will be the most inexpensive choice. Provided you don’t pay too much to have a cover designed, that is. There are many website articles on how to format an e-book for publication and sale. Amazon allows people to list e-books for sale on their site too. Listing on Amazon can help you get more exposure for your books. Do you have the skills and the desire to write a popular book? If so, this might be a good income source for you. Affiliate income is becoming a favorite way to make residual income. Blog and website owners can earn affiliate income in a couple of ways. Most web or blog sites have ads for different products or companies. Companies such as AdSense and MyFinance can install ads on web or blog sites. The ads might advertise a particular product. For example, they might advertise a pair of shoes or a beauty product. Or the ads might advertise a particular service. For instance, they’ll display identity theft protection or financial products. When site visitors click on those ads, the site owner makes a small commission. So the more visitors you have to your site, the more clicks you will probably have on those ads. Blog or site owners can make income by offering products or services too. A blog about beauty and fashion might link to a shampoo or makeup line. A blog about personal finance might link to a money management book. As people buy products from the site, the owner earns a commission. Some affiliates pay a commission to a site owner even if the person who clicked on the advertised item buys something else instead. So let’s say you’ve advertised a specific book on your site. The site visitor clicks on the link to the book. However, they decide not to purchase the book. Instead, they shop around a bit and end up purchasing a sweatshirt. You as the site owner will get a commission on the sweatshirt purchase. This is because you directed the customer to the site. It doesn’t matter if they didn’t purchase the exact item you advertised. Not all affiliates payout in this manner, but some do. Either way, affiliates can be a great source of residual passive income. If you’re a blog or website owner, consider affiliate advertising. Want to learn more about how to use affiliate marketing on your website? Check out the Making Sense of Affiliate Marketing course. Yes, it is possible to make residual income through YouTube. Ads placed on videos pay the video creator for every view. The amount paid per view by advertisers is small. However, it can add up over time. The amount of income you’ll make depends on your viewership. This is why it’s important to create videos that people seek out. Viewers tend to prefer videos that help them learn something. First, to make residual income from YouTube, you’ll have to decide what it is you know. Then, ask yourself if that information is useful for someone else. Are you great at fixing things around the house? Can you put together a short but powerful video on creating wealth? Use your knowledge and expertise to decipher what you know that can help others. Another aspect of creating videos that produce income is to not rely on the ad revenue alone. Add links within the videos to products you sell or earn commissions for. For instance, let’s say you’re making a video on how to replace the roof on your house. You might want to link to your favorite roof nailing gun. Are you making a video on how to do a certain hairstyle? Think about linking to your favorite hair products. What if you are making a video on how to create a budget? You might want to link back to your blog site or to a personal finance e-book you are selling. This is kind of like “double dipping” on the income sources from your YouTube videos. It helps ensure you’re not leaving potential income in the hands of advertisers alone. Websites such as CafePress are becoming popular as a way to create residual income. The process is simple. First, create an account with CafePress. Second, upload the designs you create to the site. Then CafePress advertises a number of items for sale with your design on it. They sell t-shirts, coffee mugs, comforters, phone cases and more. When someone buys an item with your design on it, CafePress pays you. You as the designer earn a commission off of the sale. Marketing is important too in this niche. Use social media accounts to spread the word about your designs. Hotel rental prices can be expensive. However, sites like Airbnb offer affordable alternatives for travelers. Do you have a spare bedroom in your house that’s sitting empty? You can make residual income by listing it on Airbnb. I looked through available Airbnb listings for my major city. I found they were going for between $30 and $50 a night. This could add up to some serious cash over time. Especially if you live in a high population area. Being aware of safety standards created by Airbnb is important. They’re made to keep hosts and guests safe. When listing a room in your house, don’t take any guests you’re feeling unsure about. The Airbnb site does have reviews listed for all potential guests. This feedback can help you know more about who stays at your place. This idea is genius because the designs you create don’t require real shipping. Etsy has thousands of different items for sale such as jewelry, handmade flash drives and more. A person selling an actual hold-in-your-hand item on Etsy has to do the work of creating the item. Then they have to store the inventory and the supplies to make the product. They have to package and ship the item to clients too. However, creating attractive digital designs to sell is different. All you need is a computer and the necessary programs to create them. Yes, you make the digital file. However, the buyer is responsible for print work and any framework. How many mobile apps do you use each day on your smartphone? Mobile apps are great at making life convenient for people. If you have an idea for a great mobile app, you can create and sell it online. This podcast on how to make money developing mobile apps can help. It’ll give you information on how creating apps can mean more residual income for you. Peer-to-peer (P2P) lending is crowdfunded lending. It’s similar to real estate crowdfunding. People work together to lend money to others. They each invest what they’re comfortable investing. The borrowers pay the money back with interest. The profits go to the lenders and P2P lending company. Investors get information about borrowers’ credit histories, etc. They also see what interest rate the borrower will pay. This helps investors make informed decisions about investing. As with any investment, you can lose your initial investment. Two popular P2P lending companies are Prosper and Lending Club. They’ve both been around for several years. Do you have something to teach others? Why not create an automated course? Maybe you teach others how to get out of debt. Or how to budget. You could teach people how to make money doing what you do. For instance, Kayla Sloan makes $10,000 each month as a Virtual Assistant. And more. Kayla wanted to teach others how to do the same. So she created the 10K VA course. The course shows you how you can start and thrive as a Virtual Assistant. It’s a self-directed course. That means you take the course at your own pace. And Kayla automated the course, so it helps her earn residual income. If you have an idea for a course, you can earn residual income too. Teachable is a website that can help you create the course. They’ll help you put together videos and more. It’s a once-and-done thing for you. However, you will have to market the course and make it known. What will you do with the residual income ideas above? Have you tried any of them personally? Feel free to share your thoughts on our Facebook site.